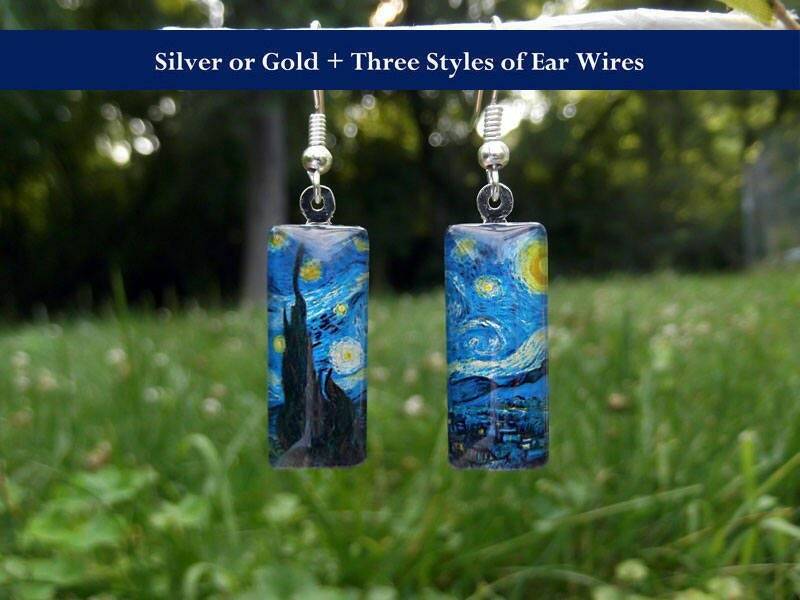 Van Gogh's "Starry Night" appears across two earrings for a unique display of the iconic painting. 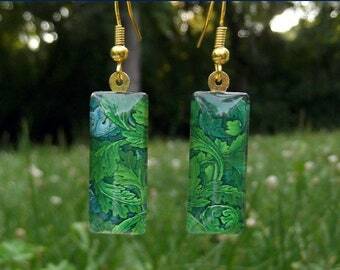 These glass tile earrings shine with beauty! 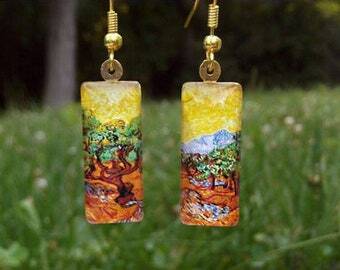 The photos pale in comparison to seeing them in person, my customers often tell me. 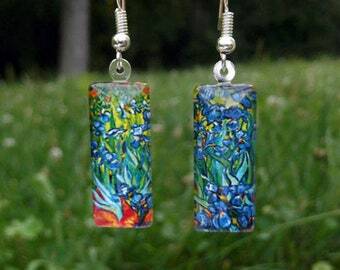 Although they are small and rather delicate looking, the glass is very durable yet lightweight. A thin layer of Earth-friendly resin applied to the back creates an all over smooth glassy look, while the rounded glass top illuminates the rich colors of the artwork. I have silver finish, but no gold, and you can choose your favorite style of ear wire: French, small kidney or large kidney. See the last photo for all the ear wire details. 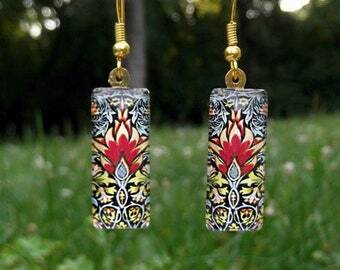 Your earrings will arrive safely in a biodegradable mailer (made of 100% recycled materials) and a bubble-wrapped kraft jewelry box (made of 80% recycled materials). Shipping is free anywhere in the US! International shipping fees are based on your location and are automatically calcuated at checkout. 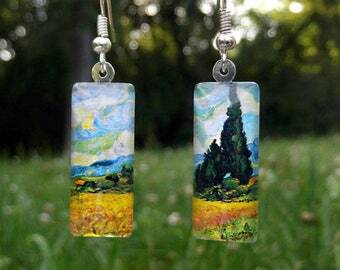 The glass measures 3/8" (10mm) wide, 1" (25mm) long and 3/16" (4mm) thick. 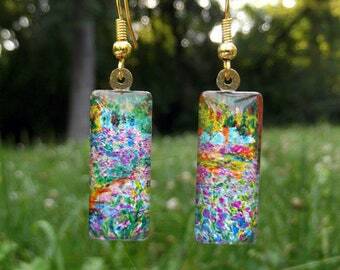 The ear wires are silver plated, and are lead and nickel free. The French and small kidney wires measure 3/4" (18mm) long and the large kidney wires are 1" (25mm) long. After the bail is attached, the back is painted metallic silver and sealed with clear resin. 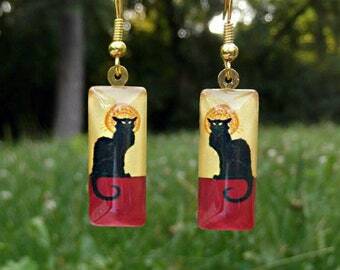 I use an all-natural resin made from sustainable sources (no petroleum or chemicals). 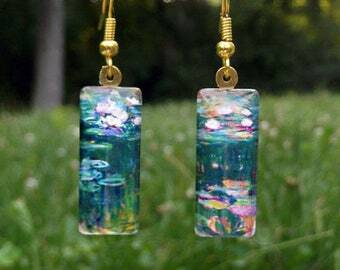 Because I purchase my supplies from other Etsy sellers and independent companies in the US, your purchase helps support other small business owners! For instance, my Earth-friendly mailers are made in Colorado and my Earth-friendly jewelry boxes are made in Tennessee. 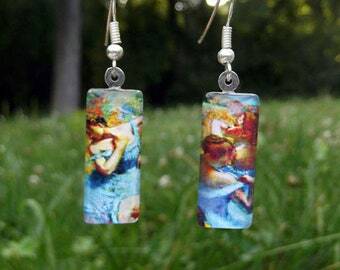 Photos, description and earring design copyright Bohemian Craftsody. 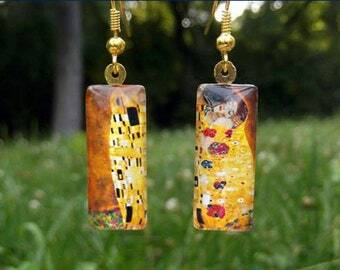 How fun to wear art work on your ears! 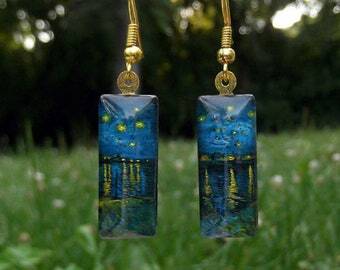 I've always loved Starry Night by Van Gogh. 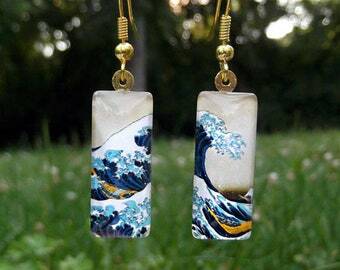 It was such a treat to find this shop's unique earrings. 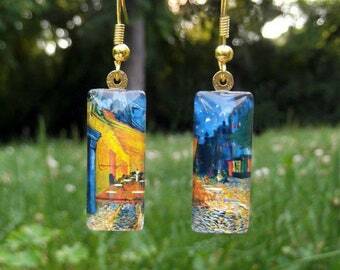 Both pairs of earrings are absolutely beautiful, even more in person than on the pictures. Send me your idea and I will let you know if I'm able to make it a reality! I require payment in advance and I will work with you until you're happy with your custom order. Preview designs and/or photos will be sent for you approval prior to shipment. I do my best to provide accurate sizing details in each listing, but if you have any questions don't hesitate to ask for clarification or more details! 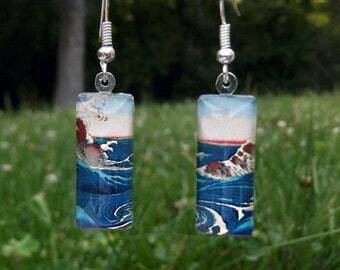 Jewelry items are water resistant but not waterproof. Please remove your jewelry before swimming, showering or bathing. Jewelry items are shipped in individual jewelry boxes. If you are ordering multiple items for yourself and would like to help save resources/reduce packaging by having your items sent (safely) together in a single box, please let me know right away. I am always happy to include a gift note if your purchase is being sent directly to the recipient. 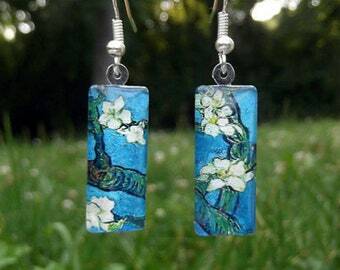 Sometimes I am able to gift wrap jewelry items when requested, but due to time constraints I am not always able to do so. If you make a request I will let you know if I have time or not.